Poet and preacher at the great synagogue 'Eẓ Hayyim, Amsterdam; died in that city Sept. 7, 1781; son of Elijah Cohen Belinfante. In an approbation to the work "Dibre David" he enumerates the following political works written by him which are still extant in manuscript in the Bodleian Library (Nos. 5 and 6 of the old Michael collection) and in the Montesinos library at Amsterdam: (1) "Shefer Tehillim" (The Beauty of the Psalms), poems on the preachers of Amsterdam; (2) "'Aṭereṭ Paz" (The Golden Crown), a collection of 87 satirical poems ("Paz" = 87); (3) "Berit Kehunat Yiẓḥaḳ" (Alliance of the Priesthood of Isaac), poems in honor of his friends; (4) "Abne Segullah" (Precious Stones), a collection of poems dedicated to some fellow-writers; (5) "Siaḥ Yiẓḥaḳ" (The Prayer of Isaac), a catalogue of printed books and manuscripts, with extracts and biographical notes on the authors, especially the Spanish and Portuguese Jewish writers of London and Amsterdam. A specimen of his work was published by Gabriel Polak in "Ha-Maggid," 1869, Nos. 10, 11. Belinfante's printed works are: (1) "Minḥat Nedabah" (A Free Offering), a poem in honor of the poet David Franco Mendes (Amsterdam, 1764); (2) "Gilah we-Ranen" (Joy and Singing), an epithalamium (Amsterdam, 1777); (3) "Ḥinah" (Lamentation), elegies on the destruction of the Temple, inserted in the prayer-book "Mishmerot ha-Layelah" (Amsterdam, 1768); (4) two sermons in Portuguese, "Sermão do Nada Moral" (Amsterdam, 1761); "Sermão Moral Sobre o Temor Heroyco" (Amsterdam, 1767); and a number of Hebrew odes ("shirim"), which are printed in other works written and published at Amsterdam. 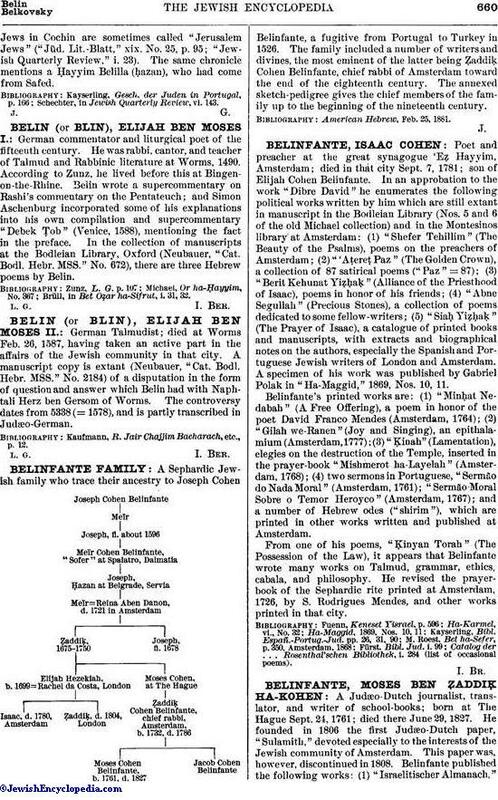 From one of his poems, "Ḳinyan Torah" (The Possession of the Law), it appears that Belinfante wrote many works on Talmud, grammar, ethics, cabala, and philosophy. He revised the prayer-book of the Sephardic rite printed at Amsterdam, 1726, by S. Rodrigues Mendes, and other works printed in that city. Catalog der . . . Rosenthal'schen Bibliothek, i. 284 (list of occasional poems).